Heartbeat is a PDQ Deploy schedule trigger that deploys packages to target computers when their status changes to online in PDQ Inventory. (This feature requires Enterprise mode in both PDQ Deploy and PDQ Inventory.) It is this status change within PDQ Inventory that triggers the Heartbeat scheduled deployment in PDQ Deploy. Every minute PDQ Deploy checks with PDQ Inventory for online/offline status changes of the target computers attached to Heartbeat schedules. PDQ Inventory sends a heartbeat ping to each target computer to watch for online/offline status changes. This Heartbeat interval is editable and is set in PDQ Inventory (Preferences > Network). The default value is 300 seconds, which means every 300 seconds PDQ Inventory checks for status changes. If you have thousands of computers in your network, we recommend that you increase this interval. For example, if you have 2,000 computers in your database it is recommended that you increase your Heartbeat interval to around 600–700 seconds. IMPORTANT: It is not the starting up of a target computer that triggers a Heartbeat schedule, but the change in the online status of that computer (from offline to online) in PDQ Inventory that triggers the schedule. The following procedure shows the steps unique to creating a Heartbeat schedule. 1.On the Main Console window, select the package you want to deploy. •Right-click the package and select New Schedule. 3.Type a name for the Schedule. 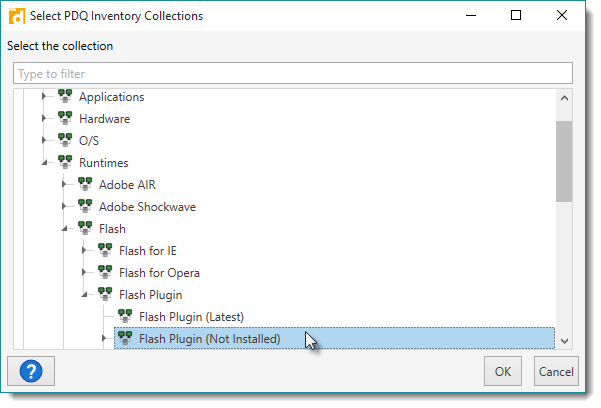 For this example we are scheduling a Heartbeat deployment of the Adobe Flash plug-in package. 4.On the Triggers tab, click Heartbeat on the Toolbar. 5. (Optional) Set a starting date and time for the new schedule or simply use the current setting. 6. (Optional) Set an ending date and time. 7. (Optional) Add a description for the schedule. 8.To add target computers to your Heartbeat schedule, click the Targets tab, and type a computer name in the Targets field, then click Add Computer. Alternately, you can also paste a target computer name (or list of names) directly into the Target area of the window. If copying a list of names, ensure that there is only one target computer name per line. You can also click Link To > PDQ Inventory Collection for a linked collection, or Choose Targets > PDQ Inventory for individual targets. When you add a target computer manually, the name appears in the list and the system (DNS) checks to be sure it exists on the network. IMPORTANT: Heartbeat schedules must be linked to PDQ Inventory targets so PDQ Deploy can use PDQ Inventory’s online status change detection capability to trigger deployments. Requires Enterprise mode in both PDQ Deploy and PDQ Inventory. For example, click Link To > PDQ Inventory Collection, browse the PDQ Inventory collections, select the collection you want, then click OK.
9.To define deployment settings for the schedule, click the Options tab. For detailed information about setting deployment options, see Creating Scheduled Deployments, Part 4: Schedule Deployment Settings. NOTE: When using a Heartbeat schedule, do not use the Preferences > Deployments option Put Offline Targets in Retry Queue. Heartbeat schedules wait for notification from PDQ Inventory that target computers associated with the schedule come online, then deploy. The Retry Queue retries deployments at regular intervals until the target computers come online. For more information, see Using the Retry Queue for Offline Computers. 10.When you are finished configuring the schedule, click OK. The package deploys to the target computers in the linked PDQ Inventory target computers/collection(s) when their status changes from offline to online. NOTE: Target computers that are online when you start a Heartbeat schedule only receive the deployment when their PDQ Inventory status changes from offline to online. These computers will need to shut down and come back online again to receive the deployment. See step 11 for an optional method of deploying to these target computers. 11. (Optional) To start the deployment immediately for target computers that are online, on the Package page, under the Schedules tab, right-click the schedule and select Start Schedule or under Schedule Details, click Start Schedule. The deployment runs and deploys to all online computers. 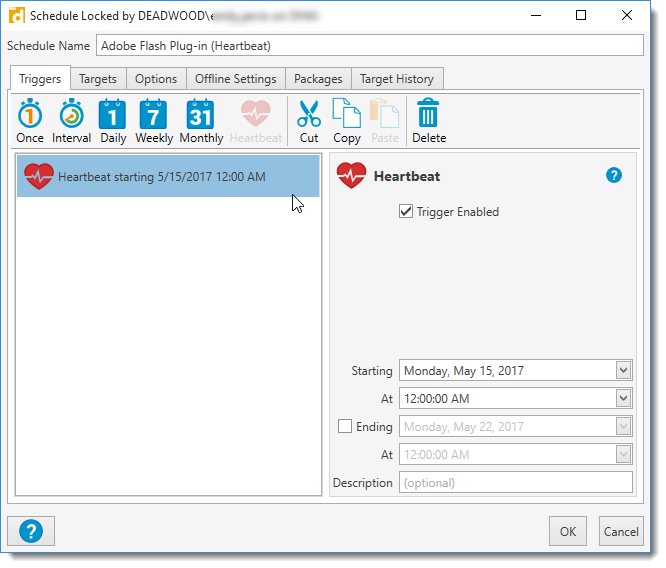 The Heartbeat schedule does not deploy to the target computers in the PDQ Inventory target computers/collection(s) that are currently offline until the next time they come online.